Yep! 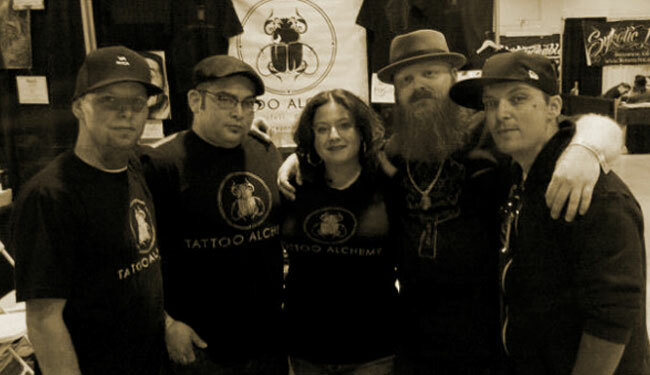 We're looking for a full-time tattoo artist to join the Tattoo Alchemy Family at our studio in Montclair California, USA. • You must be a professional tattoo artist with a minimum of 4 years experience, a folio and clientele. • You must be an artist that takes your career very seriously, and is looking to grow. • You must be Drug Free. • Calm, Considerate and Professional is how we roll... We're all about customer service. • You must be Photoshop savvy. • You must be Blood-Borne Pathogen Certified (with a certificate). • You must be registered as a Tattoo Artist with the Health Department of San Bernardino County. • You must have professional equipment. • You must be available to tattoo at the studio 5 days a week Tuesday thru Saturday from 12 to 9pm. • You must have reliable transportation. Your portfolio should be put together in a well organized manner. As an alternative, If you'd like to come by the Tattoo Alchemy Studio to interview, please call us first so we can schedule a date and time with you. Be sure to bring your portfolio on a USB Memory Card/Stick, CD or High Quality Prints in an organized manner. Be aware that we will be reviewing several portfolios over the next month. So please be patient once you've submitted your inquiry and portfolio via email. We will contact you via phone or email to schedule and interview with us at the studio. We know... It sounds like a lot. But, despite the tight requirements, we're actually an easy-going, fun and loving crew of like-minded artists. We're simply looking for someone that vibes well with us.